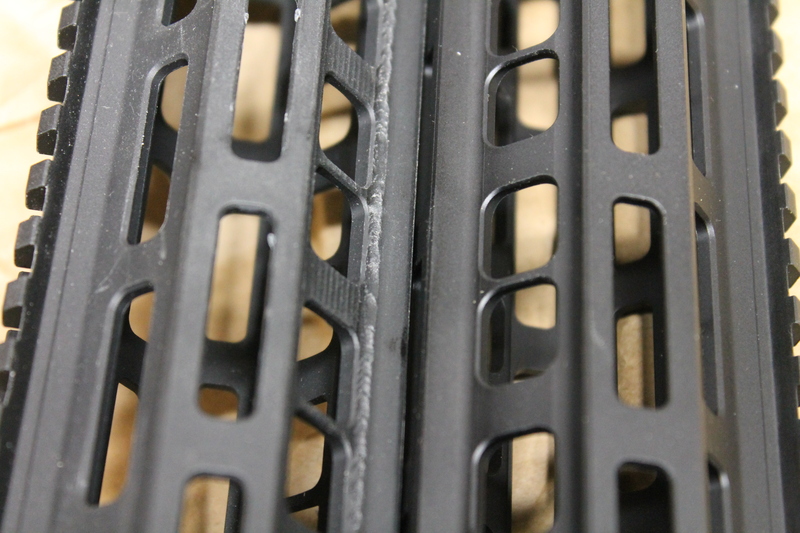 We’ve been on a bit of a tear around here testing AR-15 hand guards, specifically the modular and free floating type. For the uninitiated, the market for hand guards is huge and there’s a dizzying array of options available for those who want to free their barrel from the pressure of being touched by anything but a gas block. This also exposes a great deal of real estate for those who want the flexibility to add accessories like vertical grips, lasers, and lights wherever they desire. But first, some history . . . In the very beginning, there was the triangle-shaped hand guard that debuted in the jungles of Vietnam. Nostalgia provoking sure, but not great for mounting accessories. I’m sure some soldier somewhere taped a flashlight to his hand guard, but it was a less than ideal situation. Then in the late 80’s and early 90s, the gun world got the Picatinny rail. And oh, how we rejoiced. But people with small hands like your author quickly found that in addition to being quite modular, the “quad rail” hand guard was big, clumsy, and sharp. That’s about the time Magpul brought out the MOE line of hand guards to replace the two-piece plastic hand guards that adorned a great deal of AR-15s. They weren’t free floated, and you could stick things to them and your hands didn’t get chewed up in the process. But the truly revolutionary work (IMHO) happened just a few short years ago when VLTOR launched the KeyMod standard. With KeyMod, manufacturers were able to offer lower profile, lighter hand guards that were free floated, but still allowed for a great deal of modularity. KeyMod was also backwards-compatible with adapters that allowed the end user to stick “old” Picatinny accessories to KeyMod units until the platform gained more acceptance. Naturally, a company like Magpul wasn’t content to sit and watch as another company and standard took over. Which brings us to M-Lok, an update/evolution/refinement to the previously mentioned MOE system. 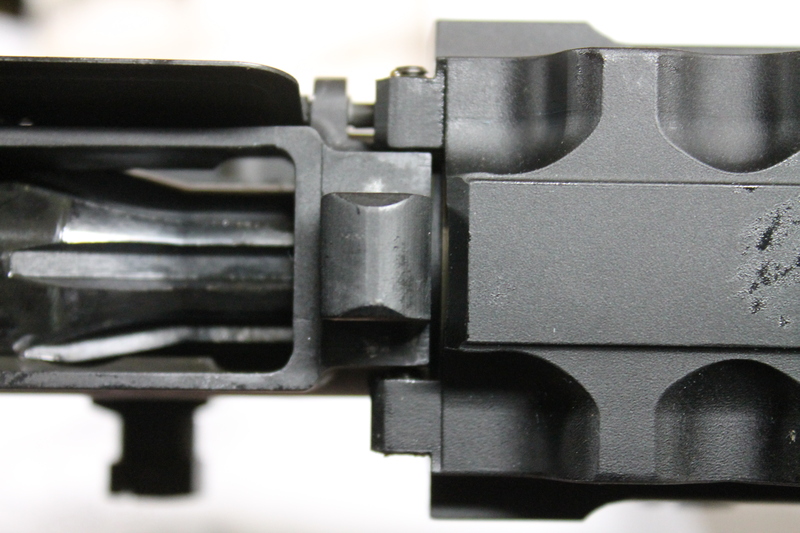 M-Lok, like KeyMod, uses a negative space attachment method where an accessory bolts to a “gap” vs. a positive space system like Picatinny. There’s a lot of detail on the M-Lok standard on the Magpul website, and for those interested in knowing more, I highly recommend you read the linked document. It should answer any questions. But Magpul makes plastic stuff, you say? They surely do. And free-floated rails must be made of metal. Right you, are dear reader. Which is why this is a review of a Geissele product, and not a Magpul product. Accordingly, Magpul released the M-Lok standard free and clear to the market. Geissele has gotten on board with the MK8 rail system, an entirely new, entirely M-Lok affair. They were nice enough to send me one to slap on my home defense gun, and I’ve gotten it installed, tested, and bolted a bunch of M-Lok accessories to it. Good news, I’m a fan. Bad news, the MK8 will cost you in more ways than one. Assuming you have an action block, or better yet, an Armorer’s kit, a sturdy vise, a torque wrench, and a hammer, you should be good to go. Start with a bare receiver, barrel, and gas block assembly. The MK 8 uses a propriety barrel nut, but Geissele includes a very sturdy wrench that works with the nut. It can also be used to remove a mil spec barrel nut. Once you have all of your surfaces cleaned and free of debris, follow the detailed instructions from Geissele available here. Due to the nature of the Geissele barrel nut, indexing the nut to align the hand guard is unnecessary freeing you to torque your barrel nut to a number you, your gun, and your god(s) agree on. Geissele recommends 40 ft-lbs, but opinions on the internet vary as to what works. Leghorn tells me that accuracy can be influenced with barrel nut torque, something that I can actually test using the Geissele system. Look forward to testing to validate that claim. Once the barrel nut is installed and torqued to the desired spec, the gas block and tube needs to be installed. After the gas system is in place, the MK8 rail can be installed. Geissele recommends a bit of oil on the barrel nut which I found helped the whole thing slide home. Once in place, the installer needs to time the hand guard to the receiver. Geissele recommends using a one piece scope mount which worked great for me. Once timed, and with the scope mount still in place, you can tighten the clamping bolts that hold the guard to the barrel nut using the included hex key. Once that is torqued, the small set screws that contact the upper receiver can be torqued down using the second included hex key. Don’t worry if there’s a larger gap on one side than the other. Its on a hidden part of the gun and you’ll probably never notice it. Once installed, the MK8 feels substantial in the hand owing to the generally beefy nature of the item. Whereas some hand guards feel chintzy, cheap, and featherweight, the MK8 feels truly solid, though a touch heavy. 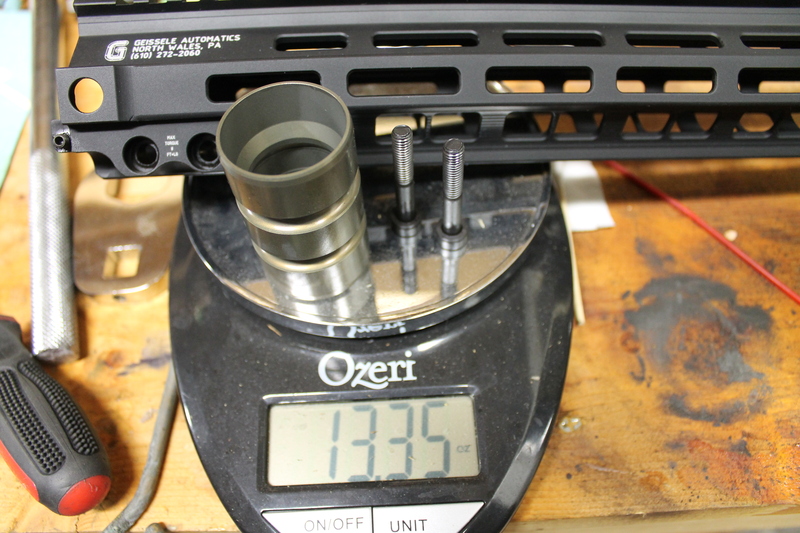 If you’ll remember, a similarly sized BCM KMR rail tipped the scales at 7.60 oz including the barrel nut. I consider that to be the “floor” when it comes to weight. The MK8 advertises a weight of 13.32 oz including the necessary barrel nut and hardware. My scale weighed it at 13.35 oz which is basically a rounding error. That’s a touch over 0.8 lbs of hand guard for those that prefer their measurements in pounds. If a featherweight hand guard is what you seek, and ounces truly matter to you, the MK 8 is not the hand guard you desire. If robust construction, and nearly unbreakable feel is what interests you, read on. Yes, the MK8 is heavy. But it feels soooo solid in your hands. When I called up Magpul to get accessories to bolt to this thing (more on that later), the rep on the phone excitedly shared that he’d been running a MK8 since release and that it was the most solid hand guard he’d ever used. I managed to beat it up a bit during testing, dropping it, throwing it into the bed of my truck, and mistreating it to some extent. I didn’t hit it with hammers or smash it with a cinder block, but it seems solid enough to take some abuse. After abusing the piss out of it for awhile, I hosed it down so I could take some pretty pictures, and that’s when I noticed the rough bit of aluminum that looked like some of the welding I’d done in high school. I sent the pictures to my contact at Geissele, and they quickly shipped out a replacement with a return label for the old hand guard. I have no reason to believe that this is the norm, and I was thoroughly pleased at their support of the product. The MK8 readily accepted accessories that Magpul sent over. In addition to Magpul, Midwest Industries and SLR Rifleworks, now offer M-Lok compatible accessories. I attached something like a dozen different bits to the Geissele rail and every single one of them locked up perfectly as designed. I have a separate article planned to compare KeyMod and M-Lok, but for now, all I’ll say is that it takes a much longer time to install M-Lok accessories than KeyMod, and if you rush the install, you’ll gouge your fancy rail quite badly. Installed Weight (Including Barrel Nut): 13.32 oz. While I didn’t love the fact that the original rail shipped with some cosmetic blemishes, I think Geissele fixed it up real nice. Like most people, I’m willing to forgive a mistake, especially when the the company stands behind their product. The MK8 readily accepted M-Lok accessories from Magpul and seemed to be built for the end times. If you’re looking for a robust rail on the M-Lok standard, I feel that the MK8 is a fine option. Looks like a possibility for my first build. But yikes 300$ is a little steep but you get what you pay for i suppose. To an extent, especially in the world of AR farkling, but not always the way you expect. Second, you might buy something that works exactly as it should, but that’s not what you want it to be doing. For instance, if you buy a super magnesium titanium alloy handguard that weighs in at 3 ounces, great, but if it winds up being too “flimsy” feeling its not the part’s fault. I bought a complete upper with keymod handguard for less than that. Where did you get a complete upper with key mod for under 300$? That would be perfect. Radical firearms. They also have sales through primary arms as well. This is just aluminum right? Been debating on choosing between one of these modular Geissele rails, a BCM KMR and the ALG defense rail, probably going to choose the ALG for the price tag. 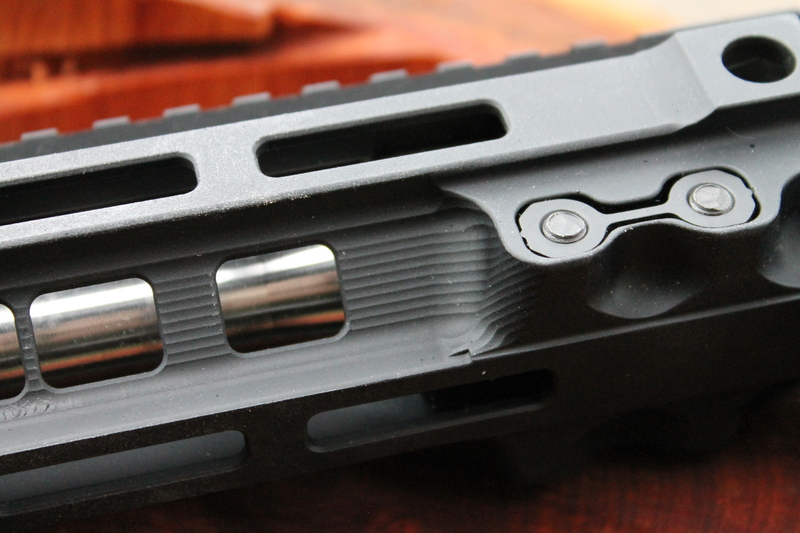 I LOVE the look of this rail though, great tip about the m-lok setup time. I went with the ALG EMR V2 rails for my rifles. The main difference is that you have to time the barrel nut and the rail shape is circular with apertures every 60° from 12 o’clock rather than the standard 3, 6, 9, and 12 o’clock faces. The price of the ALG rails is right and the feature set is enough without being too much. Weight isn’t terrible either, but it’s not BCM KMR light…but for $100 less, I’m more than willing to forgive that. Great review, Tyler. I really appreciate the explanations and brief history, along with reviews on the latest and greatst, from you, Nick, Jeremy and others on the evil assault weapons and accessories that the limo liberal Elite Who Know What Best For The Little People (EWKWBFTLP™) are desperately instructing their slaves in Sacramento to regulate here in KKKali. All the innovation means folks like Ghost Gun DeLeon, CA State Senate leader looks dumb and dumberer, and of course, their desperation to try to keep up, banning technological change, only gives all innovators and manufacturers reason to move their business friendly states (Tesla, Magpul), and accelerates the net out-migration of the actual tax payers to free states. That is the near-term end game for CA, which will result in panicky voters choosing adults, but of course, that will take a couple dozen more cities like Stockton, going Detroit style under, and a few Ferguson/Baltimores around LA, so it will get worse before it gets better. Which, of course, demonstrates to the newly awakening Millenials just how bad they are getting screwed by Hopey-Changey. In the mean time I’ll know what to put on my shoppig list, handily beta-tested by you young builders, when I move in a couple years in retirement to a free state. Keep up the good work! And thanks for doing your part to suport the slow sea change to Common-Sense Gun Know-How For All™. Its best the Maher Fans in Hollyweird dont get it, as they will be more easily eliminated in the riots to come by the Sons of Obama, along with their counterparts, in Baltimore. Relax, grind…that was my dystopian snark riff…. I won mine from Iv8888 through their January gift box. The cost to me was $30. It’s a very good rail. ok you have got to tell me what is acceptable industry standard for degrees of “timing “. i mean if you look at the wiggle factor of your everyday scope mount that could be significant for irons installed and co-witnessing. what is “good enough” ? Nice rail. Great company. Too heavy and too expensive. Also when you have to remove the standard barrel nut, you are excluding a lot of people right away. Troy just started shipping their 10.2 ounce (13inch) M-LOK rails that use the standard barrel nut for $199. The combo of price, weight and easier install will result in more sales.